This wine offers a bouquet of flavors: lime, verbena, and grilled almonds, even hazelnut. 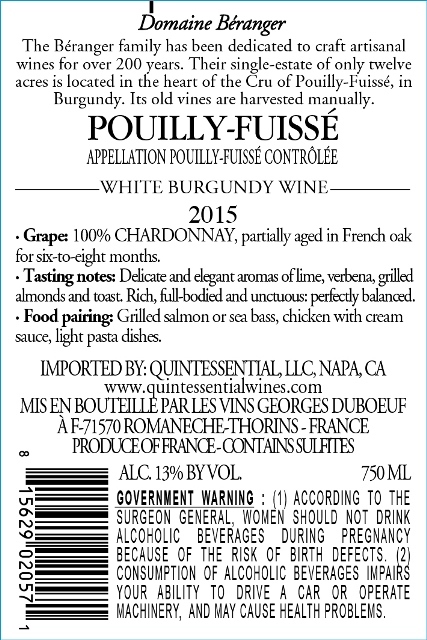 Full and fruity, it is a great white Burgundy. During the 5 to 6 month growing season, temperature and rain levels were normal and made for excellent growing conditions. By September, fruit analysis showed impressive sugar levels and healthy levels of natural acidity. For more than 200 years, the Béranger family has resided in Pouilly, a hamlet of Solutré. This area was formerly called the Béranger District. The father Emile and his son, Robert, cultivate the 12.35 acres of the estate with the help of their spouses. Emile, who was born in the house, has been tending the land for more than 50 years. Madame Béranger is also the daughter and granddaughter of winegrowers. 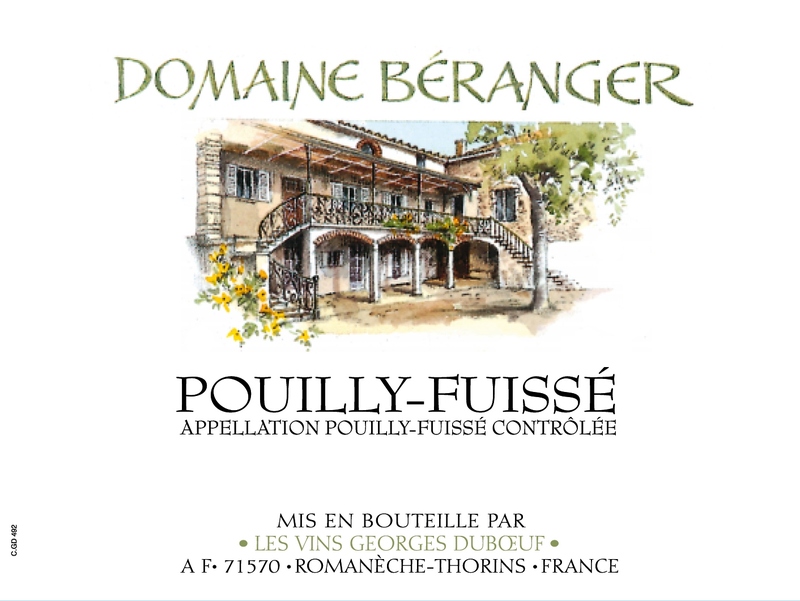 The cellar is like a second living room where guests are received, cup in hand, to talk of Pouilly Fuissé. The Bérangers love wine and vineyards, they know how to make one appreciate wine and how to extol its virtues. Best paired with grilled salmon or sea bass, lobster, chicken or fish in a white wine sauce and light pasta dishes.